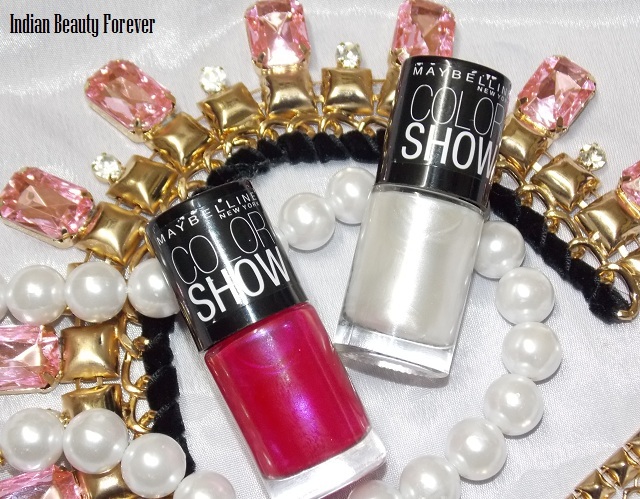 I will share this swatch post with you, where I will also review these two pretty shimmery alluring colors from Maybelline Color show nail paints. 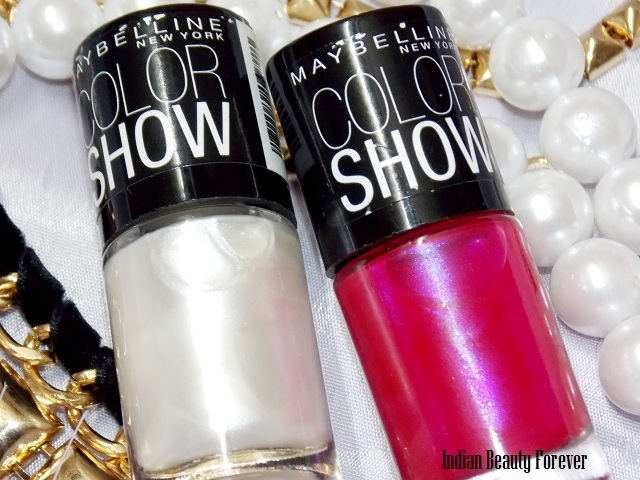 Maybelline has definitely made the nail polish lovers really happy with this Color show range due to its affordability and the diversity of shades that they have launched. I was smitten by the range and the cute bottles when these were launched last year in November. 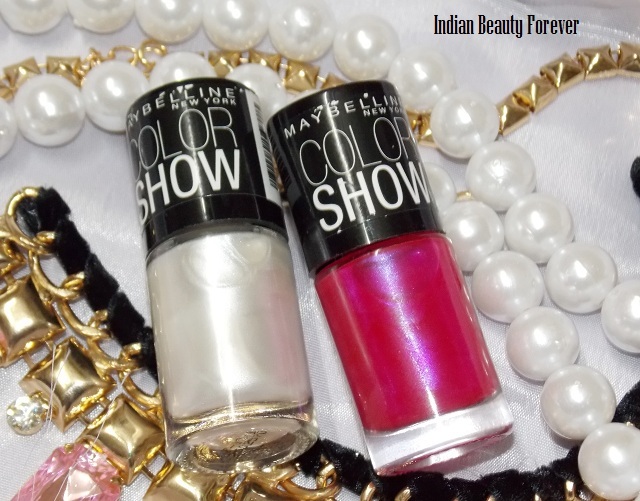 In today’s post, I will show you two colors: Kiss me pink and Moon Beam, number 003 and 103 respectively! By the way, they cost 75 rupees each; therefore, you can have as many as you want. I have collected 10 so far. Not really! It’s just that while ordering something online. I will order one of these. The reviews will keep on coming after every couple of weeks!! For a change!! Being a pink lover, obviously kiss me pink has an upper hand but that is not the only reason. In fact, the quality and the color, is what that makes it a must try! 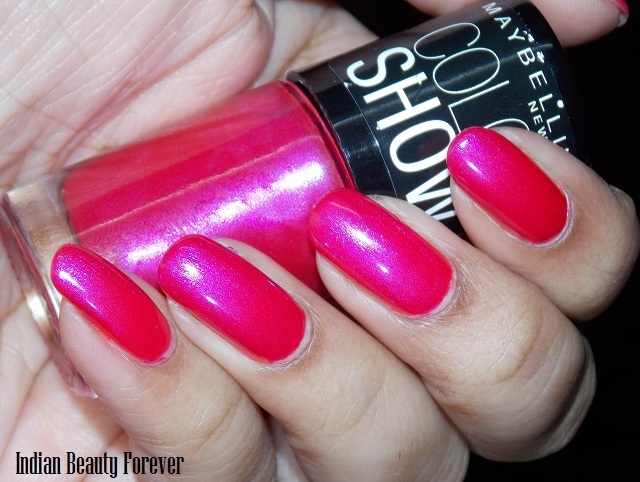 Maybelline Color show Kiss me pink is a hot blue based pink with blue micro shimmer that imparts an amazing dual tone color that changes as per the light reflection. All this gives it a beautiful effect and dimension. If you are a fan of bright colors then you should not miss this color! Kiss me Pink is a must try shade and I am in awe of it! Seriously! You can see huh I took more pictures with this than the other one.. haha. While may not be for work really! You can pair it up with your whites, black, pastel shades, every damn dress. 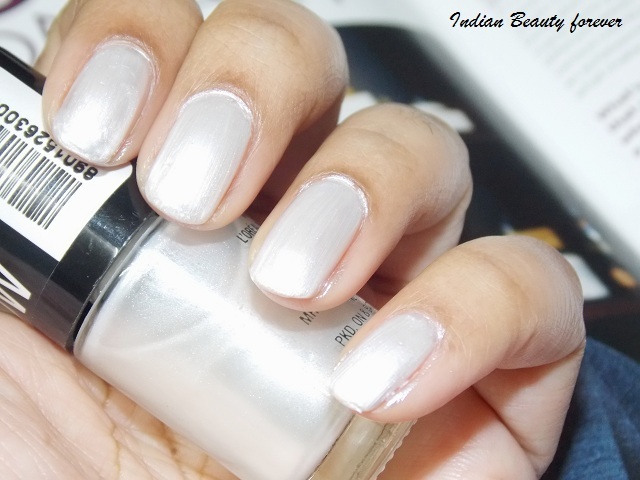 Moving one, the second color Maybelline color show Moon Beam which is a pearly white color, resembles like a white satin cloth. 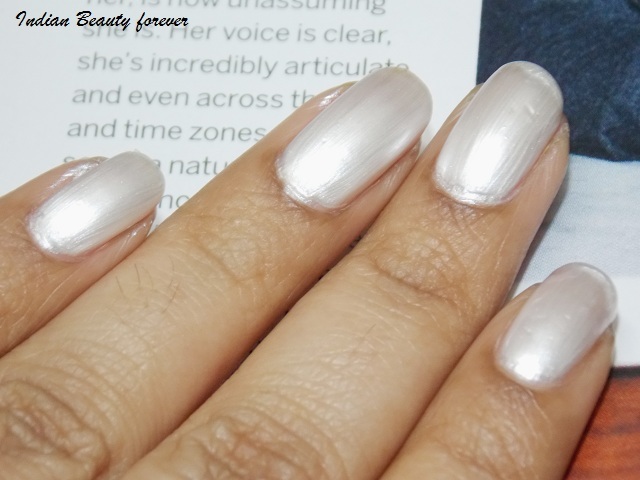 It’s a color that can delight neutral lovers and very suitable for manicures for your office. Very subtle and overwhelming color!!! Even though I like the color but this time the formula wasn’t up to the mark. I mean to say, it streaks a lot and is too sheer on the first coat. Sheer finish I can still overlook as with multiple coats that can be taken care of but streakiness is something that turns me off. The pictures that you see are with 4 coats after which it looked a bit decent. I really wish it had the pigmentation and formula as that of Maybelline color show in Bold gold or wine and dine since they had micro shimmers in them too but still gave such a nearly flawless finish!! Anyways, for that price, it’s okay.